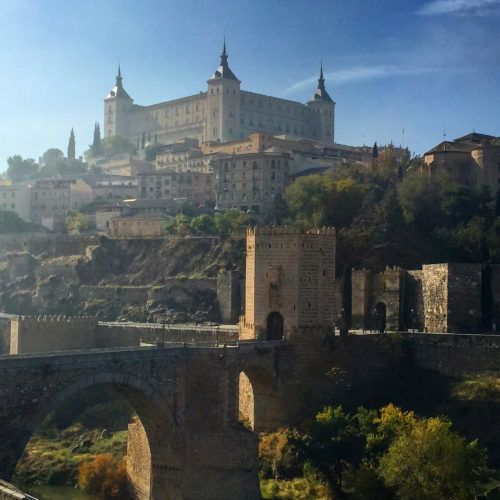 Perched above its bend in the Tagus, with sheer drops on three sides to eddying currents, and tightly-enclosed within its craggy walls Toledo has an impenetrable, monumental aspect. But, through the early morning rays, as the mists rise off the river and mingle with the low sun, her peach-colored sandstone ripens and softens, refreshing and renewing this ancient city in its parched plain. Upon our arrival the previous evening in the wondrous gloaming, and stumbling down its steep and winding alleys — so narrow as to render the pair of us laden with luggage an obstacle for even the slimmest oncoming pedestrian — the crepuscular light and looming shadows created an entirely opposite effect, one of brooding mystery and dark secrets. I can only liken it to a labyrinth, which when viewed from the outside might appear perfect and logical, but inside proves bewildering. And what a labyrinth it is! A tiny and maddeningly-constructed maze the like of which fiendish school boys create in matchboxes to confound trapped ants. Though shown as main thoroughfares on maps, even its largest streets are barely wide enough to permit the passage of the smallest model Fiat, and so serpentine and branching are they that one can think oneself on the right track only to realize a few minutes later that not only is one lost, but one is in an entirely different sector of the city. A half hour walk in as straight a line as Toledo permits would take you from the Puerta de Toledo to the old Moorish gate, Puerta de Bisagra, on the opposite side of the city, and yet, one can walk the city for hours without even glimpsing so much as the city ramparts let alone catching sight of the river. 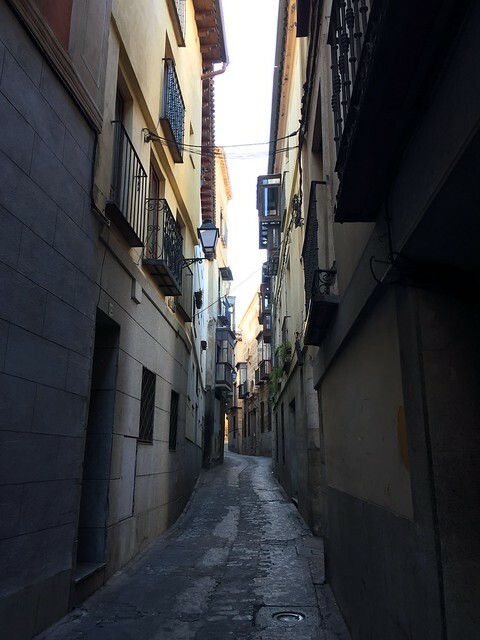 The almost organic forms of her alleys evoke the decorative aspects of some of the surviving Moorish architecture in this former city of three religions. And it would not surprise me in the least to find that researchers have discovered obscure messages to the divine in the sinuous scrawl of Arabic inscribed in Toledo’s street plan. 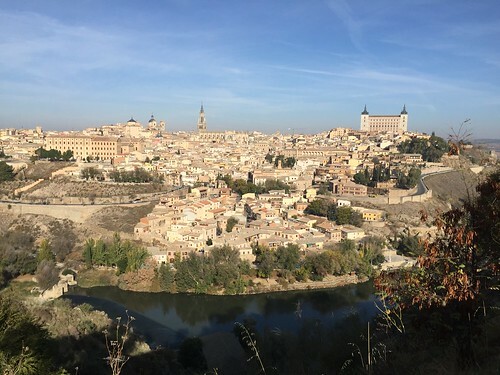 Following a brief tour of Toledo’s massive cathedral – reeking of incense and festooned with shriveled relics – we sought perspective, descending the steep, eastern side of the city, walking from morning sun into foggy umbra as we went. Across the Puente de Alcantara, we began scaling the short hill below the Castillo de San Servando, former redoubt of the secretive Knights Templar. In the cool air, we surveyed a scene thousands of years in the making: river, rock and the syncretic workings of generations piled on top. It was one of those rare mornings of absolute peace when the body is loose and the mind asks no questions. The world felt like a triumph, and, for a moment, all ours. The susurrating Tagus rushed over the weir below whispering of the occult in these ancient stones, but it was lost forever when a party of chattering septuagenarian Chinese tourists unloaded from their bus in front of us. We turned on our heels, and returned to the river. Fishermen garbed in lovat green waterproofs emerged on the banks around the ruins of the Roman bridge as the mists rose, and, as we watched, Toledo took shape before us. Again, our appreciation was fleeting as over our shoulders came the bleating tour guide and the shuffle of sensible shoes. 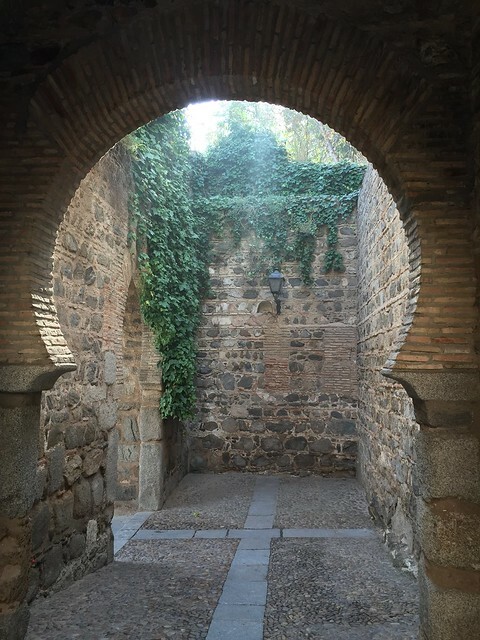 Back across the sandstone flags of the bridge we fled and up onto the city ramparts seeking haven in Toledo’s maze. Up and up we climbed until we found ourselves just below the Plaza de Zocodover, the only real open area within the old city. 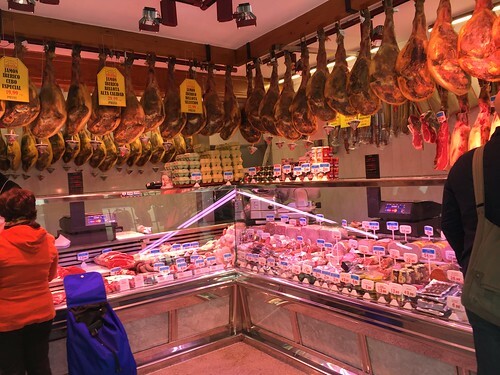 To avoid being accosted by ticket-sellers for the egregiously bright red “tourist train” parked at the edge of the square, we did our very best to behave like Toledans and quickly ducked inside a butcher’s. Carniceria Charcuteria Juan Antonio Ortega de Mora was the perfect choice. Stocked-full of meats which no-one but the locals would either countenance nor know what to do with, we found the proprietor in expansive mood and eager to discuss his wares. Following treatises on the methods by which deer blood sausages are fabricated — gruesomely illustrated with his thick, blood-stained fingers — and the beauty of the hills in which the animals are shot, Juan Antonio moved onto his array of preserved game birds. He described the careful extraction of buckshot from the unfortunate quails and partridges mimicking the use of tiny tweezers, and then, with repeated air-kisses, their preservation with local herbs and vinegar. 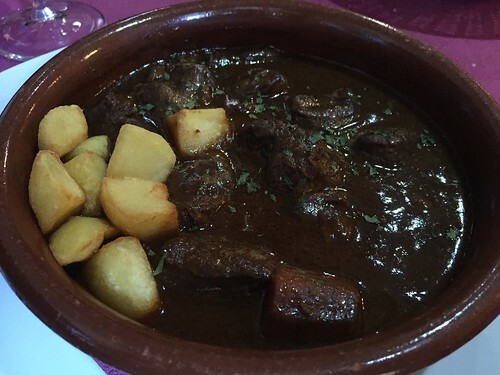 We learned a great deal, or, at least enough to be convinced to splurge on ten feet of assorted sausages and several kilos of game birds in escabeche. Feeling that our purchases were a useful disguise, we entered a tanner’s shop trying to maintain the pretense of being locals. The pungent smell of freshly-dyed hides hung thick in the air, punctuated by the straining tones of Moroccan radio and the guttural rasps of Arabic from the attendant on his phone. Feeling as if our disguises weren’t very good after some far too easy haggling, we emerged blinking into the sunlight some minutes later sporting new bags that, foolishly, weren’t large enough to accommodate our charcuterie. So, with clanking tins banging into our knees we wandered on, downhill in search of Cristo de la Luz, a former mosque. Taking a wrong turn, we wound up at a primary school outside which a crowd of parents were waiting to collect their kids for lunch. I couldn’t tell if the winsome glances of one lion-maned mother were directed at me or the bounty of preserved game I was hauling. The laughter of the home-bound children at the lunch bell echoed off the cobblestones in sonorous peels, disturbing a flutter of pigeons among the chimney pots. 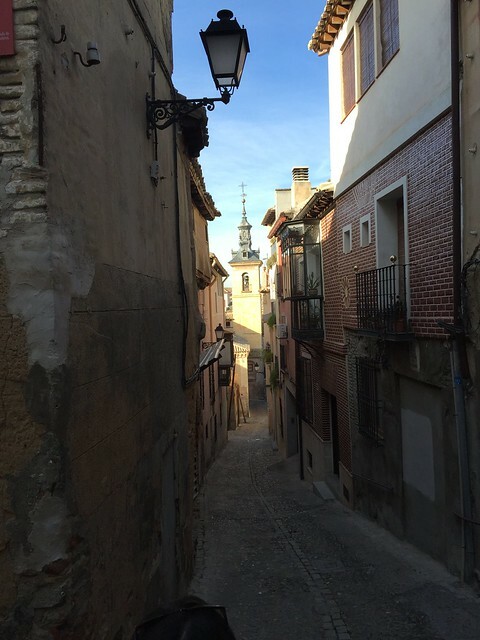 Being lost in Toledo is both easy and charming. Losing the snap-happy crowds, even in such a small place, is chief among those charms. Indeed, so tightly packed is Toledo that we walked past the tiny former mosque twice without realizing it, noticing it and the fact that it was closed for lunch only on our third pass. Understanding that before learning how to command nature one must first learn to obey it, we took that as our cue for midday repast, repairing to the narrow confines of Restaurant-Cerveceria Dragos for a delicious couple of hours. 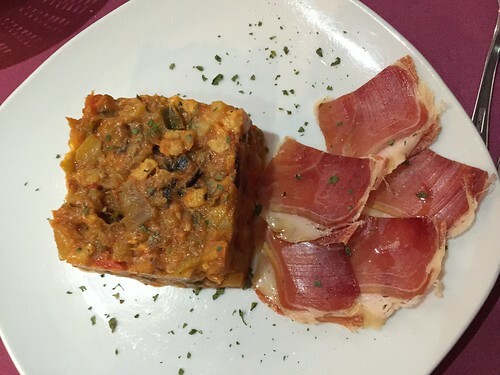 Part of La Mancha yet with its own specialties based on its unique Christian, Moorish and Jewish origins, the cuisine of Toledo is a diverse tableau. Our lunch combined regional classics — the pimentón-spiked egg and bread broth Castilian soup and vinegary eggplant salad pisto Manchego to begin — with uniquely Toledano mains — deer in chocolate sauce and the fantastically-titled carcamusas, a long-simmered pork stew with a thick sauce of tomatoes, garlic and peppers. Fittingly, we shared the dining room with an Israeli family of Sephardic heritage on a quest to connect with their ancestry. 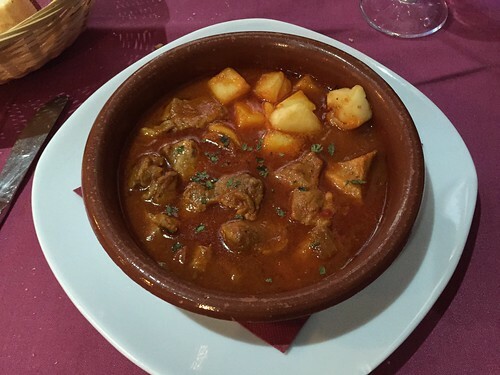 Challenged by the pork-laden menu, our pigeon Spanish proved useful. Their contentment at the seemingly meager ration of egg salad and lentil soup we helped them order put our own gluttony to shame. Returning to the medieval era, and, in spite of the haram contents of our guts, entered the Mezquita Cristo de la Luz. 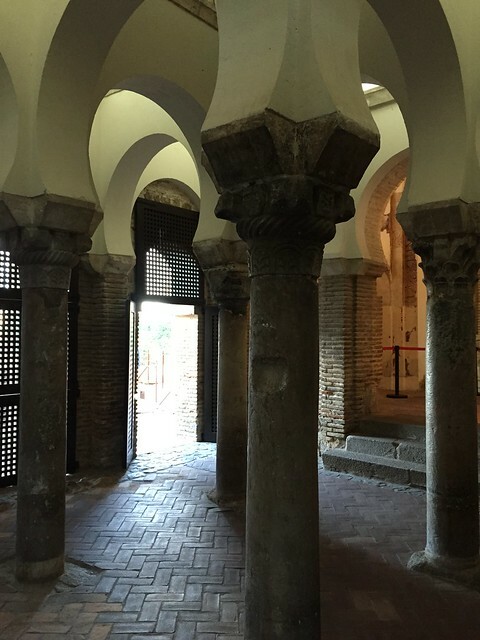 Despite having had an annex added by the conquering Christians in the late 15th century, it remains barely large enough to accommodate a handful of visitors among its slender pillars. Worship must have been a truly malodorous affair in those pre-reconquest days as the unwashed and barefoot faithful knelt toward Mecca cheek by jowl. But, its neat, geometrical gardens, overlooking the Puerta del Sol and facing the rising sun, full of appropriately diminutive cats, pouncing on one another from behind screens of lavender and bay, provided an airy retreat. If Toledo is known outside of Spain for anything other than spawning a fairly dismal namesake in Ohio, it is for the painting of El Greco. Perhaps the single most important influence on the art movements of the 20th century, the works of El Greco are virtually synonymous with Toledo. His landscape View of Toledo is said to have influenced Van Gogh’s Starry Night, and his Opening of the Fifth Seal, depicting a scene from the Book of Revelation, can be seen in Picasso’s Les Demoiselles d’Avignon. 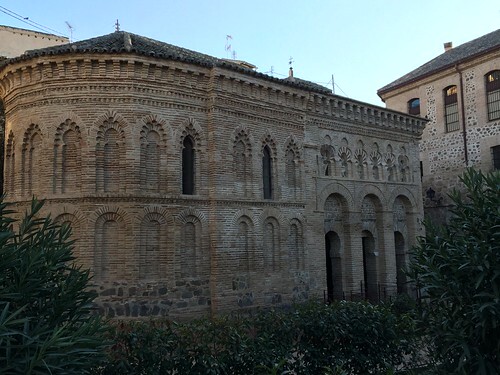 But unlike these two, his most famous work is actually still in Toledo and on view to the public for only 2 euros in the entrance to the beautiful Iglesia de Santo Tomé, provided you can elbow your way to the front. The Burial of the Count of Orgaz depicts the ascension into heaven of Don Gonzalo Ruiz. In a curiously reflexive scenario of art imitating life, Toledo native Ruiz posthumously received his title of Count for bequeathing funds for the enlargement and adornment of Santo Tomé, some of which were paid to El Greco for painting the scene in the chapel of the Virgin of the church two centuries later. The work is famous principally for the incredible series of portraits that it contains, including a selfie by El Greco. Our appreciation of El Greco’s brilliance would have been heightened had we not had to engage in a shoving match against the bustling Chinese tour group just to get a peak at it. 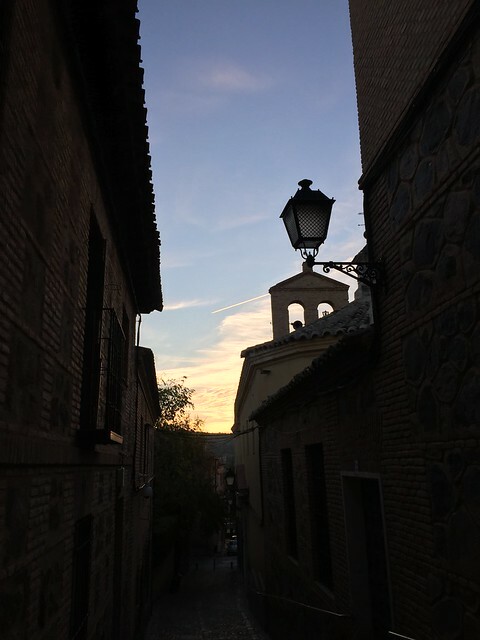 As the shadows lengthened we strode towards the dipping sun, downhill in the direction of the Puerto de Bisagra and Toledo’s historic former Jewish quarter. As we continued, the streets became narrower, a series of chicanes funneling us past jewelers, souvenir stalls and antique dealers, their assorted bric-a-brac tumbling into the street making it resemble an obstacle course with the sun in our eyes. 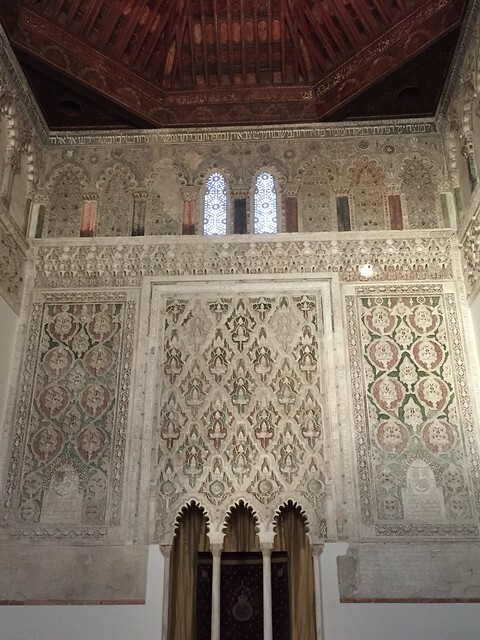 We entered the Sinagogo del Transito, Toledo’s largest synagogue as the sun was hitting the front of building square on, flooding the temple with orange light and illuminating its rich decorative stucco combining Hebrew and Arabic scripts in colorful floral motifs. Its magnificent interior is said to rival the intricate splendor of its contemporary the palace of the Alhambra in Granada. In spite of this, from the women’s gallery close to the great oak paneled ceiling, the synagogue felt empty and somehow sterile, as museums often do. But there was a sensation that the pause button had been pressed, and that at any moment it could resume its duty as a house of worship to Toledo’s industrious and learned Jewish congregation should they re-appear. That evening over vermouth and olives at a trendy after work spot I read about a TV show Cees Nooteboom quotes in his Roads to Santiago which stated that Spain misses its former Jewish communities – that were expelled and scattered to the wind after the reconquest – and would gladly invite them to return home again. If Toledo is any guide, parts of their former homes appear ready to receive them tomorrow, though if that were to happen, Toledo’s restaurateurs would need to adjust their menus. I feel so deeply ignorant about the history of Spain every time I see something like this. and the more I read about it the less I seem to know. But I will never get tired of the learning process, especially with you guys there to bear witness :)and share your findings and impressions with all that good humor. (I really hope you’ve meant to be funny because I’m laughing hard at some of this stuff–El Greco selfie?? that got a really embarrassing snort out of me–)Those photos are very good btw, and I’m put the first one into heavy rotation on my computer screen here at work. I could certainly see myself eating everything in that beautiful brown crockery too. Thank You as always for sharing all this, and good to hear from you on these pages! @Deborah: firstly, thank you, as always, for being a loyal reader. It means a lot to us. Secondly, we share your ignorance of the history of Spain. It’s one of those countries – perhaps like all countries – where the more you dig, the more you find, but you’re still only scratching the surface. Noteboom described it as a vast jigsaw puzzle to which you’re constantly finding more pieces. Thirdly, I can’t claim to be any kind of art critic and even describing art can feel very dry so I couldn’t resist calling El Greco’s inclusion of himself in his painting a “selfie” to lighten that section up. That said, I suppose that, at it’s core, that’s what it is so it’s not wrong. But, in general – and that’s what I enjoy so much about the best travel writing and attempt to mimic in my own small way on these pages – I try to convey the experience we had in its truest form. 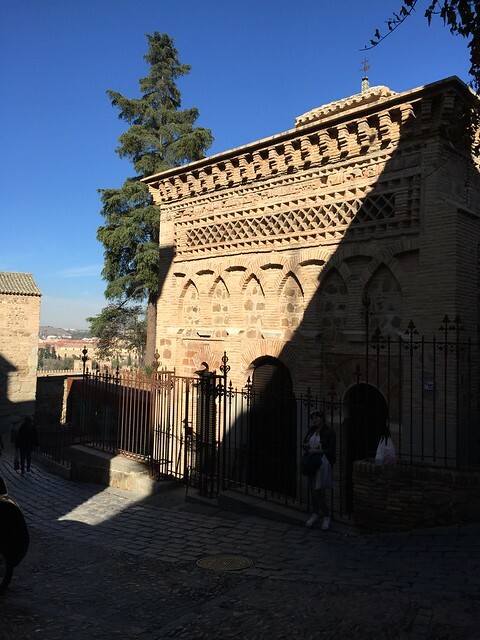 Toledo is magnificent and awe-inspiring, but our visit wasn’t just a serene stroll through its beauty. Like all travel, there were some peculiar and uncomfortable moments that provided levity at the time or in hindsight. And, fourthly, thank you for the photo props – thank the iPhone, I guess, or more properly, the many nameless architects who built Toledo! It’s easy to read and comment, the thanks go to you and others that do what you do in the sharing of honest reports of your travels and experiences, even, or especially, the not so comfy parts that we know are very much a part of travel. Plus you’re funny as hell. My search for a true and accurate account of Spain’s history and personality has mostly come from good travel writers, many of which have been suggested by you, including Nootboom and Kate Field, as well as HV Morton and a few others. I’m one of those that needs to be entertained while I learn or not much sticks. And El Greco will always be associated with a selfie, trust me! 🙂 I hope there’s more to come in the future, and any other good writers you come across are very welcome. Now to search for carcamusas recipes—can’t wait to see what I find. Thanks, I’ll look up Mr. Weiss and probably get his book too–it’s an illness, you know–but one I’m happy to deal with–especially if its a good read as well–It seems that most “new” cookbooks are at least 30% memoir/story telling which is why I cherish the older ones I read over and over, MFK, Eliz. David and Beard being good examples, (but some get a bit smarmy lately and a little too precious….) There I go again……Take care! Which month is you review? @Deborah: yes, it’s drool-inducing, isn’t it? Well go figure, I HAVE made a Weiss recipe–thanks to you–Reference your post on April 15,2014 you posted Chick Peas & Blood Sausage recipe–and we vollied 9 emails back and forth about it. So now I can get the book with no guilt, since, well, I actually cook from it, don’t I! Now I remember! That was the dish you made in Barca, right? 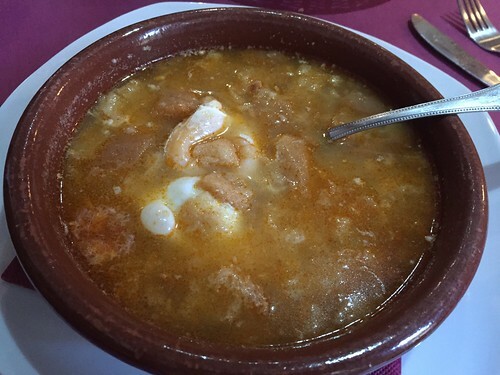 It’s embarrassing to read our old posts too but trust me, we still love you and got a huge kick out of you making that dish in Barcelona after visiting La Boqueria. @Deborah: that is very cool. I had no idea such a show had been made – which is more than slightly embarrassing both because I’m a Durrell fan and in my working life I help PBS stations raise money. I’ll definitely be all over it nonetheless. I actually picked up Lawrence Durrell’s The Greek Islands only last night and leafed through it. I’m jealous of your trip – it sounds wonderful. Please tell me you’ll spend a lot of time in London’s museums. They are magnificent and mostly underrated except the Tate Modern which apart from the building in which it sits, is wildly overrated. Stanford’s book shop on Long Acre in Covent Garden is among my favorites, though not atmospheric like some – head to Hatchards near Piccadilly for that. Food-wise Borough Market is well-worth a visit, as is Neal’s Yard cheesemongers also on Covent Garden (either before or after Stanfords), Fergus Henderson’s restaurants should be on your agenda (any of the three, but the original St. John is still the best), Rules’ (also in Covent Garden) is London’s oldest restaurant and is among the few places you need to dress-up for your portion of jugged hare. Duck Soup for a modern British take on Brit/pan-Euro food in the Soho neighborhood is terrific, as are Yotam Ottolenghi’s restaurants though they are Israeli. Naturally, there is excellent Indian (actually Bengali/Bangladeshi) food, especially in the East End. I could go on, but I’m sure you have a host of more up to date sources than I who have been over here nearly 13 years. I suspect you may want to move to Canada if Trump gets in and you’ll get plenty of understanding nods and sympathy from Remainer-camp / anti-Brexit voting Brits. Have a wonderful time! There may even be another post awaiting you upon your return! And just so I’ll have time to memorize Every Single Thing About London, I’ve ordered CURIOCITY: IN PURSUIT OF LONDON. whew. I’ll need to learn the language as well. We’re there for 6 days, so a good amount of time to see and feel it. Hoping to rub shoulders mostly with remainers—needless to say. Glad to hear you help raise money for PBS in your working capacity, it’s about the only thing I watch any more. My husband works for the cable company here so we get “all the channels”. Well, you can have ’em back, thanks….! @Deborah: haven’t actually watched the Durrells yet. We are recording them in the forlorn hope we’ll find some time to watch. But what a fascinating time to be in the UK! With the High Court ruling that Brexit must be voted on by parliament and all the red-top newspapers suddenly accusing them of treason. Ironically, many of the monuments in London date from the age of the Empire, so are in some way testament to what the Leavers’ rhetoric harks back to. But the inhabitants of that city have changed fundamentally since those landmarks were cast – and that’s what may change if Brexit goes ahead. So so true, what you said. A huge segment of the populations everywhere seem completely taken by surprise at the fundamental changes world wide. Huh? In the words of Mr Nobel Prize winner himself, the times they are a-changin’. Indeed have already. I have deep concerns for those of you with young children–but I also have to have great hope, esp. knowing parents of your caliber are out there. @Deb: It’s a very uncertain world we’re all living in, and as much as I disturbed by it, I remain optimistic that much of what we’re seeing these days is generational and won’t last. The problem of course is what will be left for that generation to inherit. We don’t really have Thanksgiving traditions yet at our house. In truth, I’m not super invested in it, despite this being my 13th such festival. My in-laws usually do what they call “ghetto Thanksgiving” in which sundry family members and friends descend on them a few weeks ahead of the actual date for an afternoon/evening of turkey and unpredictable merriment. So, by the actual day, I’m kind of done with roasted poultry and all the soft, dun-colored accompaniments and instead we often have something approaching a traditional British Sunday lunch – roast rib of beef or a shoulder of pork – with yorkshire pudding, roasted potatoes, cream of horseradish or an onion sauce (onion studded with cloves cooked gently in milk and then blended with a slice of bread and some white pepper). I’m all for currying the leftovers though – what an idea! We often do a bubble n’squeak with the leftover veg and potatoes the next day and I can imagine a big pinch of garam masala and some cayenne would make it sing under a pair of fried eggs for breakfast. Hug your kids and I’ll scratch my cats chins and try to stay brave. That’s confusing–the rib roast is for Christmas…. @Deb: you’re right, one certainly can be more adventurous with Thanksgiving dinner and make sides that break the color barrier, so to speak. It’s also a textural thing for me. Everything is soft and sloppy. Which is a weird complaint because I love Indian food which is also mostly shapeless and heavy on the brown–>yellow color spectrum, so perhaps it’s also a flavor issue? Too many pale brown, sloppy and slightly sweet things with comparatively little flavor. It sounds like what my grandmother was fed in hospital and what we used to be served for school lunch in the early 80s. And with respect to “recipes” for bubble n’squeak – and far be it for me to descry Helen Graves – but you can make it from whatever you have leftover. Literally anything. Carrots, potatoes, cabbage, brussels, beets, green beans, fennel, peas, parnsips, celeriac, broccoli, kale. It’s all good. The more brassica family, the better, in my opinion as cooking it down intensifies both the sweetness and the bitterness and you still get the crunchiness. Fingers crossed for tomorrow. I’ve taken to walking in the woods to ease my anxiety about it. A new study reveled that proximity to trees reduces blood pressure and disquiet. Should Trump be elected, I might take to the woods and hide when it’ll be useful to know the way through. Well. I guess we’ll be looking out for you guys in the woods. Deep in the woods. ← All You Chicken Hearts – Be Quiet!